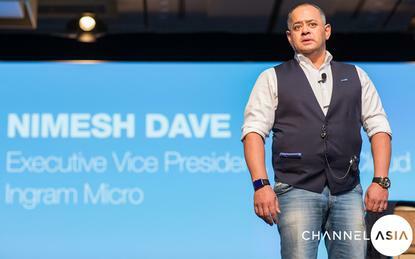 Revealed to Channel Asia during Ingram Micro One in Singapore, Ingram Micro now falls under the banner of “solution aggregator”, breaking with the traditional tag of distribution. Creative marketing perhaps, a PR strategy possibly, but such a public admission adds further weight to the theory that the conventional channel is being turned upside down, inside out and back-to-front. Driven by CloudBlue - a newly launched cloud commerce platform - Ingram Micro is making inroads into a new area of the market, a market housing independent software vendors (ISVs) and IP builders. Central to such a shift will be ISVs, seen as new weapon in the Ingram Micro cloud arsenal. “Every partner is going to be an ISV,” Davé said. “Every partner at some point of time has carried out a project of custom development and created IP. “But they have never thought about how they monetise that IP. There’s not only one person that wants that IP, they could be 50 million. "Today, I would categorise all partners as ISVs. We have the largest ISV pipeline that we have ever had. That’s new software." In response, Davé said Ingram Micro will soon roll-out self-boarding capabilities for ISVs, allowing software creators to deploy solutions onto any marketplace. Delving deeper, Davé acknowledged that the solution aggregation capability also evolves into another layer, resulting in Ingram Micro becoming a system integrator in some instances, as an example. For the channel, such a shift in focus could be seen as competitive, with system integration, consulting and professional services core aspects of a partner offering. “This is not competitive,” clarified said Mike Zilis, executive vice president and group president of Asia Pacific at Ingram Micro. “It’s about partnering with the right types of partners depending on what the specific need is. A new identity for Ingram Micro implies new competition, moving the business away from historical rivals such as Tech Data, Synnex, Westcon-Comstor and Arrow, among others. “There’s a lot of different smaller players that we compete with now,” explained Davé, referring to a blurring of the lines between industry players. As the channel evolves from a linear model of vendor - distributor - reseller, to a more advanced state of innovation and collaboration, the spider web is widening. Does this mean the role of mediator is over? Is there still a need for a go-between in a cloud world? To clarify also, the traditional distribution functions that Ingram Micro is famed for are not going away - they remain a core aspect of the business and a crucial aspect of the company’s go-to-market plan. But resellers, managed service providers and system integrators are changing, driven by the emergence of ISVs, start-ups, consultancy giants and developers. “The most prevalent example of change has been in the cloud space,” Zilis added. “We had a reseller base, some of which were willing to move into a cloud space, alongside many more that were born-in-the-cloud. "It’s the same way we address the evolution of the customer base. Think of it of an overlay structure, we can service our existing base of customers and drive technologies into that base, while bringing them along with education and new offerings. “Then we create an overlay to bring in that new type of partner focused on new areas of technologies. It’s about building a new base which is wider and cultivating that with the right sort of attention and ownership. “But it’s the same process and you get into a normal rhythm and begin to build maturity." Now, a little left of centre but... have you ever been greeted at the gates of a property with a gleaming white smile? A well-dressed agent in a tailored suit, binder in one hand and a gigantic set of keys in the other? Welcome to the world of the real estate agent, seen by many as untrustworthy smooth-talkers, a mega-rich bunch driven by commission, dominated by making a sale and shrouded in skepticism. Now take a second look, because for partners today, they are now your competition. “Look at those who are closest to the customer and that understand where the opportunities are,” advised Mark Iles, executive consultant at Tech Research Asia. "That’s the channel, in whatever capacity or shape that takes, those that know what is happening in the market and can assess key areas of growth are providing the value. “If you look in the data centre space, businesses are leveraging real estate agencies because they have valued information and customer knowledge. When a business moves office space the first thing they do is engage with a real estate agency. Whether that be product upgrades, wireless networking or perhaps more advanced capabilities around the Internet of Things (IoT) or cloud, in general, Iles said refreshes are commonly triggered when businesses switch locations. Likewise for Ingram Micro, a new channel is emerging through finance. As a result, Davé said everybody is going to become a provisioner of something. “If I can connect you with an API, I can provision anything and anybody can do it,” Davé said. “That’s where we are going. A girl guide could become a provisioner of cable services if they want to.